This is the most pinned Halloween look of 2016 | HELLO! October 13, 2016 - 15:13 BST hellomagazine.com We're not surprised! We don't know about you, but our Insta feeds are chock-full of Halloween make-up and outfit ideas at the moment. But this one really caught our eye – and it's actually the most pinned Halloween look of 2016! As you can see, it's a magical unicorn costume and is so colourful it's almost blinding. Since being posted to Instagram a year ago, it has been pinned to more than 105,000 boards on Pinterest this year. Want to recreate the look? We recommend lots of hair chalk in rainbow shades – or just get an amazing wig. 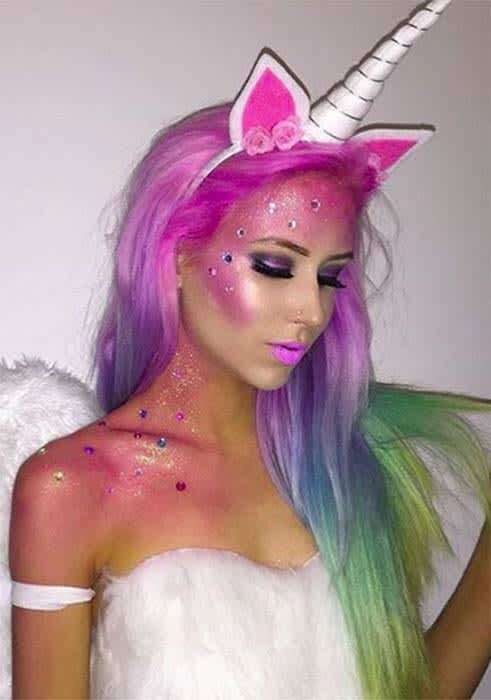 Then you'll need lots of glitter and pink make-up to complete the look. The image was created and posted by user @amythemermaidx, who boasts nearly 300,000 Instagram followers. Her signature is her stunning pastel-hued rainbow hair – we love!